Welcome to week 3 of the CHIP IN Education Initiative! This week focuses on how we can continue to educate cardholders and small businesses about chip card payments through card issuer resources, social media and media interviews. You can share anything here as-is, create your own communications and resources using this messaging, or do a combination of the two! Get started by checking out the free downloadable resources below, and pick a few ways that you can share them internally and externally. Then educate via social media using the recommendations we've provided. Finally, follow our media communications tips when preparing for interviews to ensure accurate reporting on the U.S. migration to chip! A great way to educate consumers on chip card payments is through communications from their card issuers. This week’s resources will help card issuers train their call center and in-branch employees so they can, in turn, educate cardholders consistently and accurately. The issuer training infographic explains how cardholders use their chip cards to pay in stores, and the issuer FAQ answers the key questions surrounding the U.S. migration to chip. Download the issuer training infographic here and the FAQ here! Use these recommendations to educate your customers and cardholders, and feel free to incorporate your own ideas, too! Do you have issuer customers? This week, let’s join together and focus our social media efforts around the "how to" steps and added security of chip card transactions. Use these posts and/or create your own using #BenefitsOfChip, #CheckForTheChip, #EMV and #ChipCards, and link to www.GoChipCard.com! Have you looked at your credit and debit cards lately? Check for the chip. You may already have a chip card, or may get one soon. Paying with your chip card instead of your magnetic stripe card brings you added security for in-store and ATM transactions. 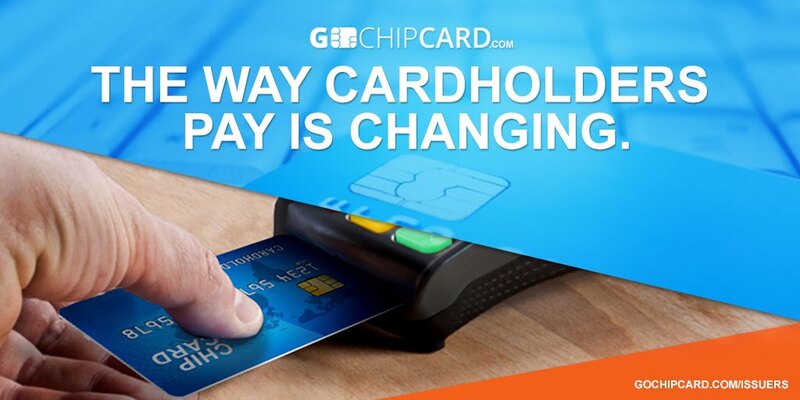 Learn more about the benefits of chip at www.GoChipCard.com. Consumers and small businesses get a lot of information from the media. Communicating accurate and consistent messages with the media is one of the easiest ways we as an industry can help educate the market about chip cards and chip card benefits. How do cardholders use a chip card in stores? Anywhere. Their card will have a chip and a magnetic stripe to accommodate any situation. When will cardholders be able to use the chip at all merchant locations? Every day, more merchants are becoming chip-enabled to increase security for in-store card transactions, so cardholders will start to see these terminals at many of the places they shop today. Cardholders will continue to be able to pay at both chip-enabled and non-chip-enabled merchants with the same card. Where can cardholders go to learn about chip cards? 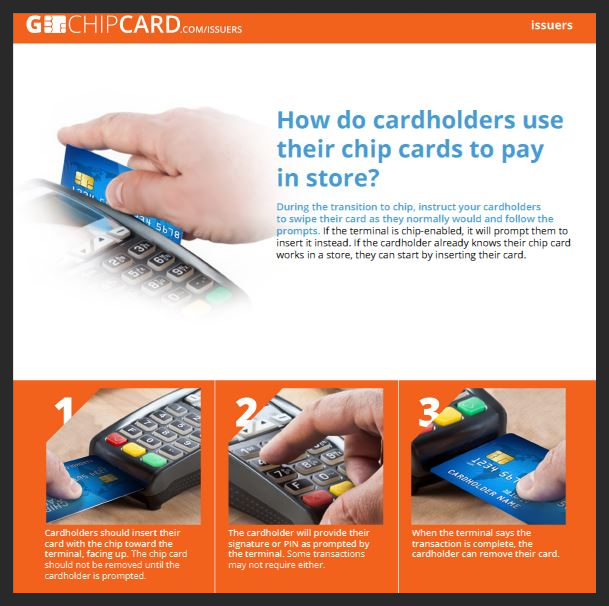 Cardholders looking to learn about chip can find answers to common questions at GoChipCard.com. It teaches how to identify a chip card and a chip-enabled terminal, why they're receiving them, and how to use a chip card in stores and at ATMs. GoChipCard.com is the official, go-to resource for consumer education on chip cards. Want to learn what chip cards are and why you’re getting them? Want to learn how to use them in stores? Visit www.gochipcard.com. Be sure to catch us next week with consumer resources on chip cards at the ATM! Questions? Contact us at info@us-emvforum.org. Was this forwarded to you? Click here to sign up to receive this directly to your inbox! Did you miss last week's mailing? Click here to view the archive. For more information about EMV chip technology, visit www.emv-connection.com, and for more information about the EMV Migration Forum, visit www.emv-connection.com/emv-migration-forum. You are receiving this email because of your relationship with EMV Migration Forum and the Payments Security Task Force. If you do not wish to receive any more emails, you can unsubscribe here.